German Swami Gauribala Giri of Jaffna (1907-84) was, by all accounts, an enigmatic colorful figure known throughout Sri Lanka for decades. His playful antics and iconoclastic ways often disguised another side less well known to the public, for he was also an erudite student of the Philosophia Perennis whose theories concerning Sigiriya and Kataragama were decades ahead of the more conventional wisdom of professional academics. Sam Wickramasinghe met German Swami at Kataragama in the 1950's and through him came to meet other swamis including the renowned sage Yogaswami of Nallur. Still lively and outspoken at 80, Sam is widely sought out by younger seekers for his colorful accounts of past experiences and exploits. He is also an accomplished writer, many of whose articles have appeared over the years in the Sri Lankan English press. The following article is from a previously unpublished manuscript and has been expanded by Kataragama.org editor Patrick Harrigan who was also a close associate of German Swami since 1971. Time: the 1950's. Kataragama was then a sparsely populated pilgrimage outpost. The road from the nearest town, Tissamaharama, was then an untarred, rutty and uneven. There was no police station or commercial centre as found today, except during the July festival when crowds thronged, mostly Tamils from the North or the upcountry tea estates. 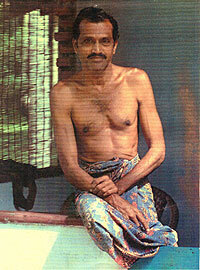 Swami Gauribala (better known as the German Swami) was seated upon a deck chair, puffing his favorite Jaffna 'manilla'. I was seated there upon another chair in the open verandha of the late Alwis Appu's tea boutique whre the slippery, muddy gradient without steps like today, led down to the Menik Ganga not far from the Mahadevale gate. "Swami, if God Kataragama is said to have had two wives, can't we also do the same?" Gauribala looked at him, gave me a wink and asked, "Why do you ask this?" The man fideted a while, plucked up courage and replied, "I am married and also have a mistress. My wife has come to know this and there is hell at home!" Swami laughed heartily before looking serious as he replied, "Yes, you could. After all, if gods can -- and they are supposed to have made man -- why not man? Certainly you can. No harm. But don't exceed two!" This was German Swami, ever ebullient, witty and iconoclastic, whom I had first met years before as he was bathing in the Menik Ganga in a loincloth. In another incident at the same venue -- German Swami's favorite spot to inhale the deadly fumes together with a cuppa tea -- another poor soul queried Swami, perplexed as to why there was so much evil in the world. Swami Gauribala inquired of his religion and the inquirer said he was a Christian. Then Swami asked, "Who built this troublesome world?" Well, God is said to have done so." "What kind of work was His creation? Plenty of flaws, like what we do?" The work of God is all-perfect," the man repliled, good Christian that he was. To which Swami retorted, "Then why do you see imperfection in this mysterious being God, in whom you believe?" On another occasion at the height of the July festival, German Swami was at the Mahadevale gate with begging bowl, chanting the refrain Pinata mokutwat denna. Coins flowed in, perhaps because he was a european mendicant. A richly-dressed mudalali-type with puja wattiya was about to pass by when Swami repeated the begging mantra. The man looked at him, embarrassed, and touching his breast pocket said, "No change." Pat came the instant reply with feigned humility and a side-grin at me: "We also accept big notes!" A while later Swami thrust the bowl into my hands and disappeared to answer the call of nature. During the interval, a friend of mine from Colombo saw me, torso-bare and begging bowl in hand, and was quite surprised. He knew I was a friend of Swami, and when I explained, he put a ten-rupee note (which was a large sum in the 1950's) into the bowl before going into the Mahadevale. When Swami returned and saw this, he said, "My, you are a better beggar than I. I will have to commission you to do this task on a percentage basis from the take!" At another time, a pilgrim cornered him and sought his advice to pay off a vow. "Swami, last time I came here, I made a vow in return for a favour. It was granted and I want to give one hundred rupees (which was a princely amount those days). How best should I do it? Give it in a puja or to a beggar?" Swami pointed to the fire pit alit with burning camphor and said, "Throw the note into the fire!" The man was aghast and horrified. "How could I do it? This is money!" Swami explained saying that the devotee's vow was to give to God Kataragama in gratitude and not to gain merit for himself by doing it for puniyam (spiritual merit). Years later, we were at Alwis Appu's tea shop when a man accousted us and asked German Swami whether he could remember him. Swami looked hard at his face and shook his head. "Why, Swami, can't you remember? I am the man who asked about the payment of that vow. You told me to burn the money." "Ha! Yes, now I remember! So what did you do finally?" After much thinking, I did just what you asked me to do. And today I am here again, happy because I became very prosperous after that!" Swami hinted at the mental conflict the poor man must have had before he did the act -- how enslaved people are by money. Ask anyone to tear up or burn a big note, and see the reaction. Of course, we do sometimes tear up money in anger -- other people's money, he said laughingly. Swami's life at Kataragama took a different turn after the arrival of Governor-General Lord Soulbury's son the Hon. James Ramsbotham in Ceylon, who later shocked his illustrious father by opting to reside in Kataragama with Swami Gauribala instead of staying at Queen's House. It was a strange sight to see the two white men in white vettis walking about Kataragama. Soon Ramsbotham came to be known as Soulbury Swami. The Ramakrishna Mission had a very prominent place and sacntified role in the affairs of the day then, before it was closed and taken over by misguided politicians. Any pilgrim was assured of a resting place and free meals for a maximum period of three days in clean, hygenic and quiet surroundings. Daily at lunchtime a limited number of tickets were issued to the poor locals and beggars who queued up at the gate. The authorities felt highly honoured and privileged to serve Lord Soulbury's son as a sadhu. He was invited to come daily for meals, along with Swami Gauribala and any of their guests. But German Swami at times insisted that Lord Soulbury's son took his place in the queue with him and others for meal tickets. 1956 photo taken at Kataragama of the 'Kutti Kuttam' around German Swami (standing 2nd from right) including Pulikutti (Sam Wickramasinghe, standing at left), with Sam's caption below. Top row left to right: Sam (Pulikutti), Adrian Snodgrass (Punaikutti), German Swami, Allirajah (Trustee of Appaswamy Matham) immediately after all danced kavadi in 1956. 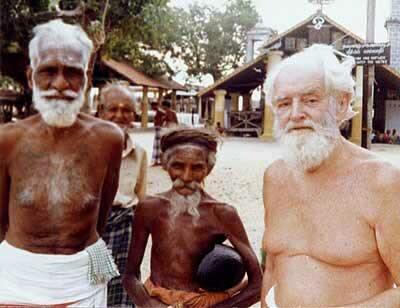 Bottom: Barry Windsor (Narikutti), Shankarappillai Swami, Soulbury Swami (Annaikutti).  Once or twice I was also invited to join in the fun and everyone was thrilled by the marvel of seeing pure-blooded English aristocracy, bare-bodied and in white waistcloth, mingling with the bedraggled and dirty, true to the Tradition that all are equal at the feet of the unknown and unknowable Divine. Unlike today, the Tamils who mainly frequented then adhered strictly to this custom, assuring all and sundry irrespective of position or place in society. All were addressed as swami, meaning literally Your Lordship, the mode of address to their God. And all males went bare-bodied above the waist, a gesture symbolic of leaving social distinctions behind and literally baring one's breast in the presence of the Deity, leaving one's ego behind. Quite a contrast to today when politicians and self-powered people vying with each other with influence and 'big-notes' to get themselves served and to attract the attention of the priests first, without taking their turn with the rest. In the late fifties, an incident at Kataragama involving Swami Gauribala and the late Spencer Rajaratnam precipitated a change of place in the life of German Swami who, with the help of Soulbury Swami, shifted to Thondaimanaru Selvasannidhi Murugan Temple in the Jaffna peninsula where Soulbury Swami helped to build an ashram for him and where he lived until his demise on May Day, 1984. Swami Gauribala had been born in Germany in 1907 to an upper class family as Peter Joachim Schoenfeldt. In the mid 1930's he embarked on his spiritual quest (or Grail Quest as he called it) after coming under the influence of a circle of poets in Berlin led by Stephan George. Under the baleful eye of the Nazis, he and a small circle of Morganlandfahrers or 'pilgrims to the East' set off by ship to Ceylon to don the ochre robes of Buddhist monks at the Island Hermitage (Polgasduwa), Dodanduwa near Hikkaduwa. Ven. Bhikkhu Nyanakhetto, as Swami Gauribala was then known, was arrested by the British authorities in 1939 when the Second World War broke out and interred at the massive internment camp at Dehra Dun in the Himalayan foothills along with hundreds of other Axis nationals. There, he disrobed and, together with five German associates, finally escaped (on their fifth attempt) and made his way to the Tibetan border where they waited out the war in a remote Buddhist monastery. When the war was over, Schoenfeldt descended to India and took up the life of an itinerant recluse, or sadhu. In North India he was ordained into the Dasanami Order of Adi Sankaracharya and given the initiatic name Gauribala Giri. For years he wandered across India meeting saints and sages such as Ramana Maharshi of Tiruvannamalai, but still he could find no one who could satisfy his spiritual thirst. The turning point in his life came when Swami Gauribala returned to Ceylon and journeyed to Jaffna. A lifelong bibliophile, one morning he was browsing through the 'spiritual' section of the Lanka Book Depot on KKS Road in Jaffna town when an old white-haired and rather wild-looking stanger suddenly snatched the book from out of his hands and said, "You bloody fool, it's not found in books! Nee summa iru!" This was his first encounter with Yogaswami of Nallur. His search was ended and he accepted Yoga Swami as his Guru Nathan after many trials and chastisements. 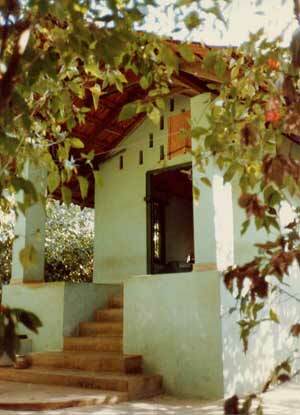 German Swami's kutti residence, the heart of his Selva Sannidhi ashram Summasthan. Taking seriously the upadesam of his Guru Nathan, German Swami spent a lifetime penetrating into the mysteries of summa iruttal, of 'being still' or 'remaining natural'. This only could perhaps explain the outwardly puzzling spiritual stages that he passed through in the remaining course of his life until his samadhi in 1984. He sometimes corresponded with close friends, but he never published the findings of his >>Mu<< research as he called The Work, his destined Grail Quest. However, he did meticulously assemble and publish two hundred copies of a work that he named the Summa Irukka Suttiram, a compilation of ancient verses expounding the significance of summa iruttal. In the mid-60's the authoress Maggi Lidchi of Aurodindo Ashram wrote a fictional account of one seeker's experience of living in German Swami's ashram, "Summasthan" (London: Luzac & Co., 1967), entitled simply Earthman. The story has twice been targeted for production as a feature film but both times the producers failed to secure adequate financing. But it may yet appear on the big screen, despite the seemingly endless conflict in present day Sri Lanka. 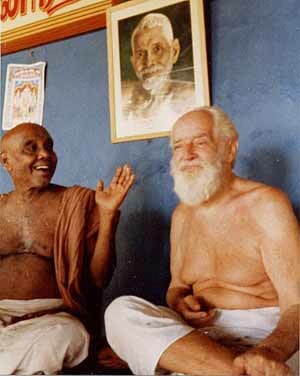 Like his guru before him, German Swami also walked in the karai yatra from Jaffna to Kataragama. In fact, walked it not once but twenty-five times, ceasing only in the mid-seventies when his once-robust frame could no longer take the strain of the 55-day walk. German Swami's classical education in Germany, combined with his passionate 'Grail Quest' and practice of foot pilgrimage to sacred sites culminating in Kataragama led to his passion for 'sacred geography', especially such power places as Kataragama and Sigiriya. His understanding of Kataragama bore fruit in the book Kataragama: The holiest city in Ceylon by Paul Wirz, originally dictated by Swami Gauribala to Wirz in German.